I suppose that most people read my blog for the sea angling pages. Anyway, there's no doubt that if a week or two go by without a new 'Saltwater' item, some people seem to think that I've died. The truth is that I tend to go after the fish that maximise my options - I suppose you'd call it playing the percentages and this sometimes means giving the saltwater a miss. Recently, when the tide has been just right for a particular tactic the weather has been against it and when the weather has looked good the tides have been out of sync. If everything looked right I didn't have any suitable bait. Added to this, if I go fishing and don't get a sniff there doesn't seem to be much point writing about it. Last week I'd used up the mackerel heads that my pal Nigel had given me so when we were doing the weekly shop and I saw that there were three herrings on the fish counter in the supermarket I bought them. The fish were dirt cheap and all three cost me only one pound-forty. By cutting them up, into three heads and six fillets, I reckoned it was costing me about 15P per bait. I froze most of my purchase for future reference and kept one head-and-shoulder to try the following morning. Low water was about 05:30 hr so I arrived on the shore just before 06:00 hr as the tide began to creep in. For once there was little wind and although the edge of the sea was choked with crappy weed, by walking I managed to find a spot where it was reasonably clear and began to fish. I gently lobbed the herring head about five metres out with a swing of my 4Surespin and sat on a boulder to wait. A seal appeared to keep me company at 06:15 but it left after five minutes. The tide crept in and twice I had to move back onto a new boulder, letting out line as I shifted so as not to disturb the bait. At 07:00 I had a storming run which took 30-40m of line at high speed. The fish was moving so fast that even though I dropped the rod point it was impossible to close the bale before the line pulled tight. Nevertheless the rod bowed over and I was in. In it's run the fish had passed several submerged boulders and I could feel the line juddering round them as I tried to gain the upper hand. After about five heart-in-mouth minutes I had the bass on the surface and almost at my feet. When I got a close look at it I began to talk to myself “Expletive, expletive, that’s a big fish!” (I estimated double figures). Then, as I drew it towards me, the HOOK POPPED OUT. As I said to my pals "If this was paper it would be wet with tears." I guess that it was just rotten luck because in my experience bass hooked on big circle hooks rarely come off. Anyway, that was that. A few days later my pal Rob emailed to say that him and his Dad had caught a few mackerel. Now mackerel have been as rare as hen's teeth so when he asked if I fancied giving it a try the following morning I was rarin to go. We arranged to meet in the car park at 04:15 and I was there first. I removed my gear (bag, spinning rod and fly rod) from the car and waited. By the time it got to 04:25 I realised that my pal must have encountered a problem and I set off for the rocks on my own. It was still pretty gloomy when I began to fish. 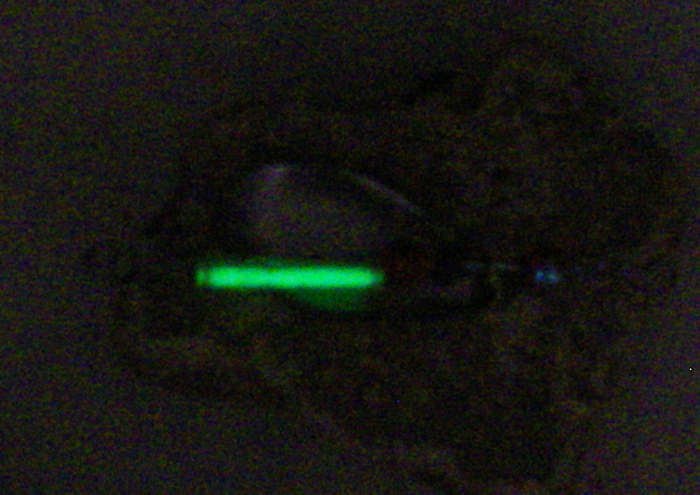 I'd decided to start by spinning with a newly made luminous spinner which I'd constructed using a green tritium 'Betalight' attached to the shaft of the lure and coated with the transparent 'Aquasure' that I use to fix holes in my waders. The lure worked perfectly. 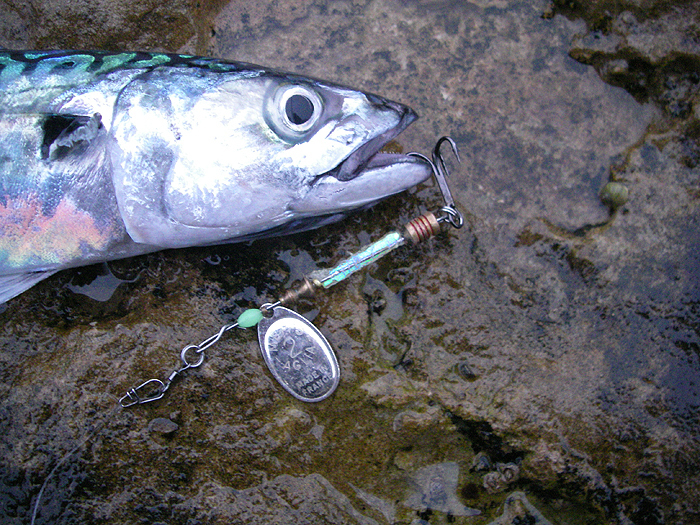 Second cast the rod whanged round and I was into a hard fighting mackerel. For the next four casts the whole exercise was repeated but three of the fish dropped off as I lifted them. 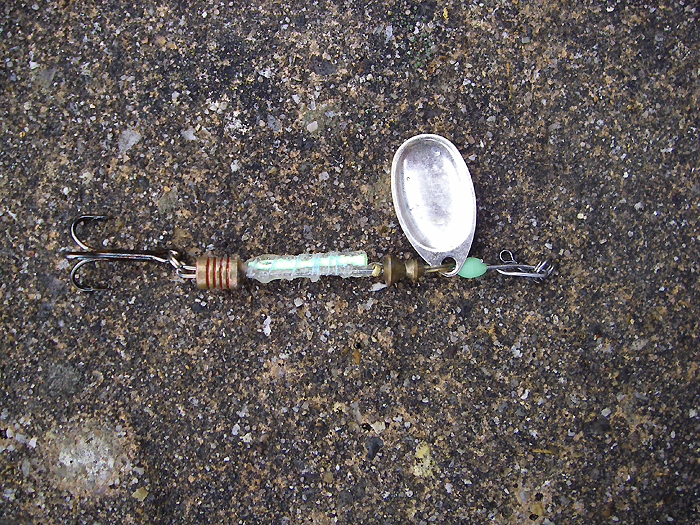 I decided that the treble that I'd used was too small so I switched to a Toby with bigger hooks. This was much better and before the fish 'went off' after about an hour I'd landed nineteen. I kept some for baits at first and when I had sufficient I shook the ones that were lightly hooked back into the sea. Hopefully one or two of my baits will produce bass in the near future. Oh, I forgot to say, Rob had encountered a minor domestic problem so perhaps we'll go again tomorrow? 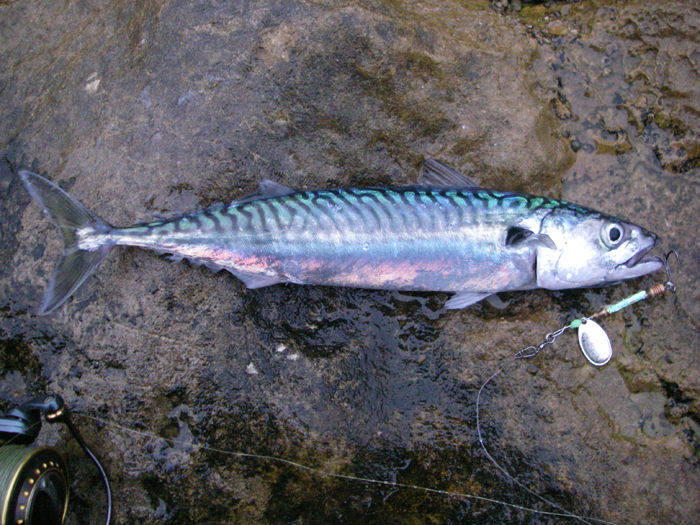 Mackerel make good livebaits!